Kid Acne’s art can be seen on walls all over the globe. 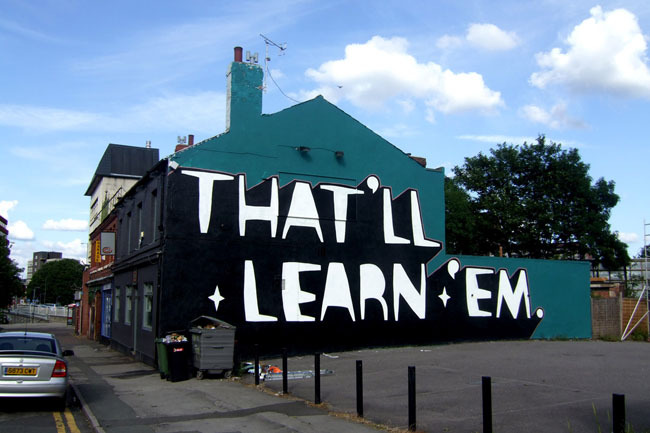 The Sheffield-based artist is best known for his comic-like illustrations and larger-than-life slogans. 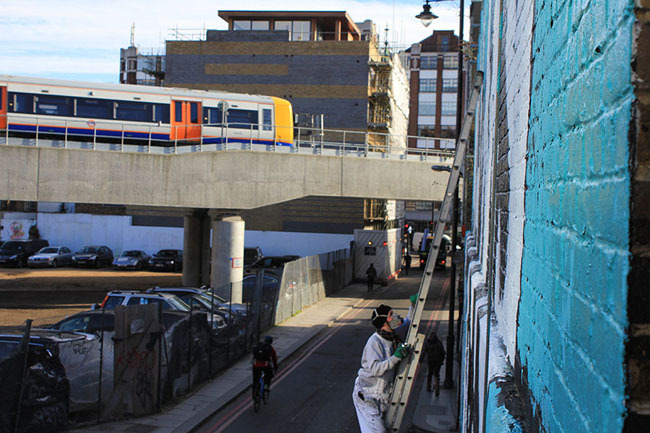 He recently completed his biggest London mural and Street Art London had the chance to sit down with this one-man-army to pick his brains. 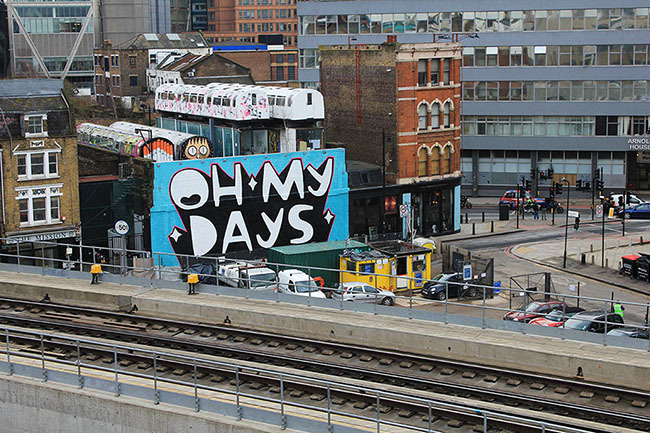 Why did you choose the phrase “OH MY DAYS” for the Village Underground mural? I’ve been painting phrases for a while now. I probably did the first one around 2007 / 2008. I made hip-hop music for a number of years and when I was in a phase of making a lot of music I wasn’t really painting that much. I would write lyrics and ideas for songs in the back of my sketchbook and after a while I noticed I was writing more words in my book than I was drawing pictures in it. I thought I should really use them for something, so I started painting these slogans. They’re just every day phrases that people say. I think it is nice to paint things that people can relate to, plus it has a lot of impact. Initially, it was almost as though the buildings were having a conversation. 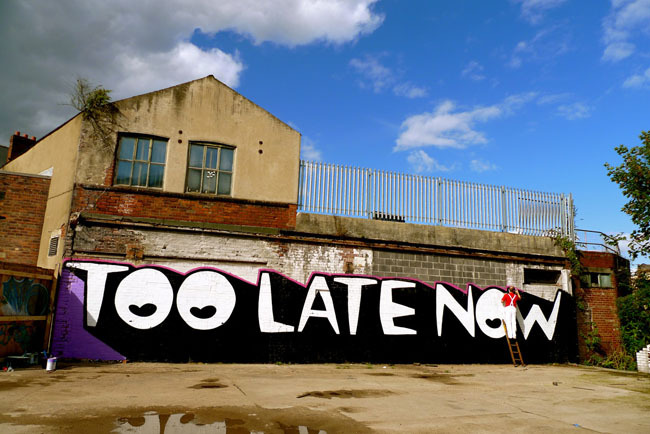 I painted one on my old art college before it got knocked down that said “You’ll Miss Me When I’m Gone”. I’ve always had it in my head that if I did a slogan in London it would say “Oh My Days”. People don’t really say that up north, so for me it’s a typical London phrase. I like painting big, bold stuff. It’s a good excuse to paint letters without having to write my own name over and over again. I’ve always liked drawing. I just copied my brother – we used to draw a lot of stuff and I was never really into sport. I guess I developed the style that I’m known for now before I was really into graffiti. When I did get into graffiti, I tried to do what I thought was “graffiti style”. I soon realised that I was just replicating what other people had done and that they had done it much better before as they were the originators of that style – so I started doing graffiti in my own style, which was more illustrative. Since then it’s been about trying to refine that style or at least get the proportions right. I look at some of my old pieces they’re really lopsided, like they’re in a hall of mirrors. How does your professional training impact your work? I did a screen-printing course when I was 15 and when I was making fanzines and record sleeves, I printed them myself. Printmaking helped me to refine my style as well. Fine Art was also good because it allowed me to experiment with different ideas. 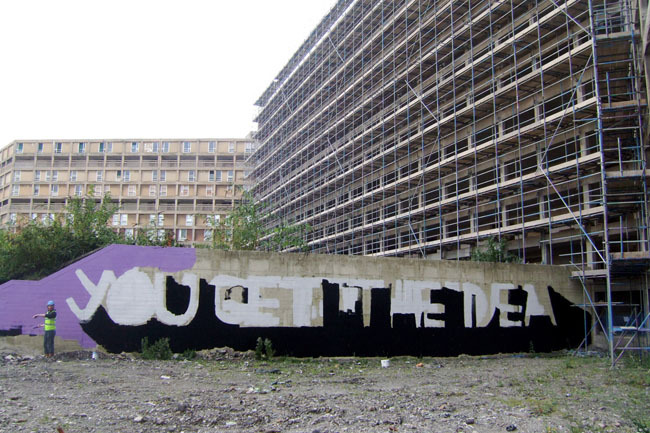 Having said that, I probably had more encouragement from older graffiti writers than I did from my old art tutors. I kind of had alternative schooling in that sense. 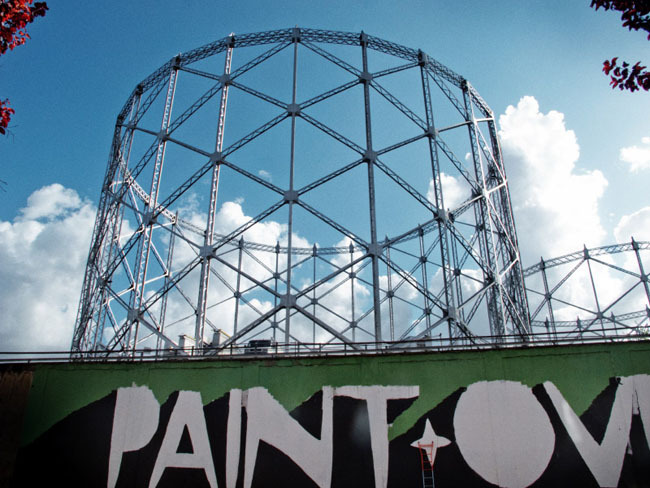 You learn a lot from graffiti – composition, use of colour, how to document your work, and how to plan. It teaches you to work with whatever you have at hand and make the most of it. Some people choose not to make anything until they have the perfect scenario but if you do that, you never get anything done. You’ve mentioned before that you’re illustration style is something you adopted from your brother at a young age. How did your brother influence your style exactly? Our style of drawing is just very similar. When I draw a character the facial features consist of one line for the nose, one for the mouth and two for the eyes, and that’s it. I don’t draw nostrils, eyebrows or extra detail. My brother and I used to draw in that style as kids and I got it from him – he’s two years older. The characters I paint now relate back to the drawings we did when we were four or five years old. I’ve just stuck with it. Same with the lettering style that I’m painting on the VU wall – that’s what I used to do on our gig posters, on the back of our record sleeves and in my comic books. It’s basically my own handwriting on a larger scale. There are a lot of really talented people that paint stuff in the street but they often take characters from other people’s comic books or they take typography from other sources. I like to present my work in my own style, no matter how simple it is. What about your characters, where do you ‘find’ the inspiration for them? They’re kind of like a hybrid between B-boy characters and Fantasy Art, as well as children’s book illustrations. It’s all merged together. Sometimes I paint animals, a lot of the time I paint these female warrior characters, and other times I paint weird, random stuff. You and your brother used to draw comic strips together and you would draw yourselves as super heroes. What kind of super heroes were you? I can’t really remember but we used to play tricks on my dad using our ‘magic powers’. We used to bury his cigarettes in the garden because we wanted him to quit smoking and stuff like that. So normally it was just like weird, silly little games. It was more about the idea of having a different persona or identity I guess. That idea has translated over to our art and music – it’s what we’ve always done, created different personas for ourselves or whatever. What would you say are your biggest inspirations? Prolific people. People who paint all the time. Eine was painting around the corner while I was doing the VU wall and having people like that around helps to motivate you. I guess that’s my biggest inspiration – like-minded people who are consistent at what they do. I don’t want my work to be too refined; it becomes contrived when it’s too perfect. So, as much as I want my paintings to be neat and well done I also want them to be quite loose and raw. 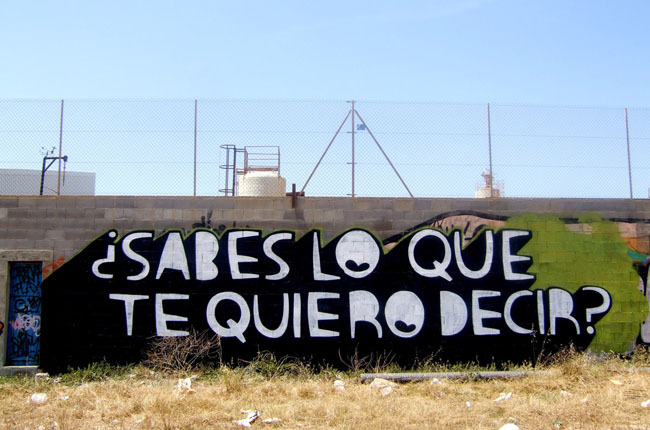 That’s another thing from doing graffiti, you have the mentality to do more stuff rather than one perfect thing. I started writing Kid Acne when I was fifteen and a spotty teenager. I had other names before that but I also wrote ‘Acne’ as a tag. A lot of hip-hop artists had ‘Kid’ in front of their names so I just took that idea. It’s was one of a number of names, but it was the one that stuck. I’ve been Kid Acne for almost 20 years now. How do you pick a wall or a space to work on? Does the surrounding environment influence it at all? Sometimes it does but other times I might paint a wall just as an excuse to take a photo of the stuff around it. 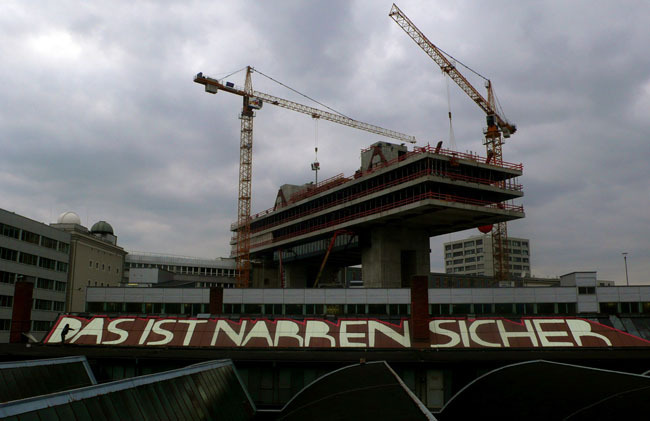 The wall I just finished (Village Underground) is a really good shape and size for doing big typographic stuff. Other artists have done more intricate paintings on there but it’s right by the train line and a lot of people walk past it – so for me, it’s good to go big and bold on something like that. I like big and simple stuff, but it all depends where the wall is and what mood I’m in. Is there a specific city or project that stands out from the rest? I’ve definitely enjoyed every city I’ve ever visited to paint. Ultimately, it all merges into one – You’re stood in front of a wall painting and that’s it. 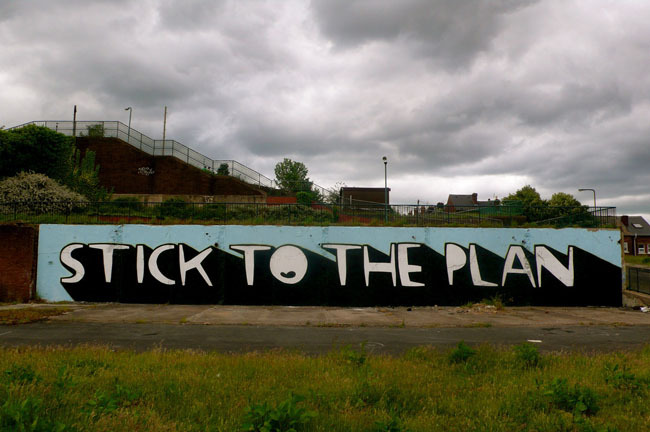 After I did a bit of travelling a few years ago I started painting these slogans in Sheffield. I thought, “You know what, it doesn’t really matter where I am in the world”. Most people are going to see the work online anyway. It might sound cool to say “I went to Brazil or China or wherever” but actually there are loads of good walls where I live so I now paint more in my hometown. It’s nice to travel but I think it’s good to make use of your own surroundings. I don’t really paint in London very often because I feel like there’s such a big scene here already and the walls don’t tend to last that long. I can do the same piece in Sheffield and it might last three or four years. 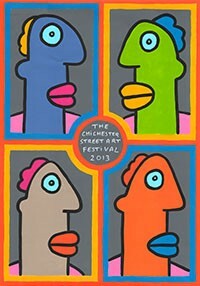 You don’t think there’s something to be said for the ‘outsider’ bringing a different style or perspective to a city? Yeah, it’s all good – but I think some people only want to go where there’s already an established scene – it’s like jumping on the bandwagon to get recognition through association. I feel that building a scene in my home town alongside a small group of artists has more longevity in a way as it’s something we can all feel proud of and responsible for. I’m not responsible for the London scene – I’m just a tourist here. Paris has a wicked scene for example and as much as I like painting there I’m not going to start trying to compete with all the artists who actually live in that city. It’s cool to travel but it’s also really good to paint where you live and push that above everything else. That’s what I feel I’ve been doing over the years, there’s a bit of a vibe up there now and it’s cool. What has been one of your most challenging and/or rewarding projects? The museum show I did a couple of years ago in Sheffield. It was a big deal because it was my first show in my hometown. It was the biggest project I’ve worked on and over 50,000 people came to see it. When you started out did you ever expect your art to blow up as much as it has? I never expected to do a museum show but I don’t really think about it as such. There’s always someone else who’s bigger than you or more famous and there are always others who are up and coming. I try to concentrate on whatever project I’m working on at the time and once I’ve finished that project I move on to the next thing. What would you say is the general response to your work? Have you ever had a really negative response? (Laughs) Yeah sure, all the time. I’ve got it now while painting the VU wall. Some people hate it, some are indifferent, but if you try to appease everyone you end up diluting your output and start second guessing everything. Once you do that your integrity and individuality goes out the window. 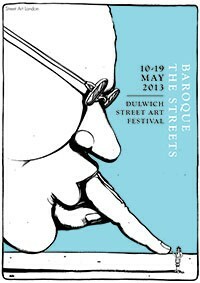 When I’m painting in the street I know the public is going to see it so I want it to look ‘well done’ at least. Other than that I can’t really worry about what people think of it or if it lasts or not. Since you started out how do you think the scene has changed? More people know about street art now but there are still the same arguments and controversies that there were 20 years ago. People are still in discussion about whether it’s art or vandalism. In a lot of ways it hasn’t really changed at all. It’s just that more people are aware of it now and have an opinion on it. I guess one thing that has changed is the documentation if it. There’s no denying that it exists! 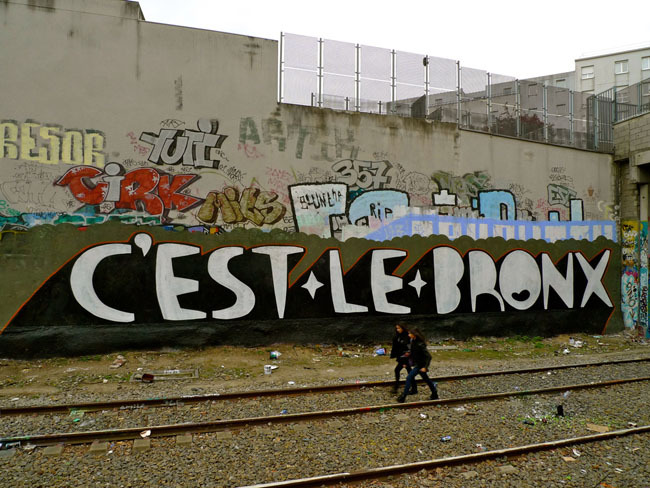 All the hype around street art has had a sort of knock on effect to graffiti writers too. People have started looking at their work more as a result. Across the board you have so many different styles, you have some people who are very accessible and commercial and some who are very off-key and niche. I think that diversity is really good. In the beginning of the hype around street art – people were only really interested in the accessible stuff but now I feel they’ve started to actually look at individual artists more. I can’t imagine not doing it – it’s part of my life. It’s not always in the street but I’ve always painted and made stuff, from music to illustrations, exhibitions, printmaking and fanzines. I sort of switch between all these different things, which keeps me occupied. I have a few creative outlets in that sense. Do all these different platforms influence each other? Definitely. They used to be very separate but now they all kind of merge together and it’s more harmonious. There have been times in the past when I was battling one thing against the other but it’s like having conflicts for no real reason. No one has asked you to do this stuff, you’ve chosen to do it – so it’s better if you’re happy about it I think. Tell me more about the relationship between your music and art. In the beginning the music and art started off as the same thing. They were both ways of presenting imagery and narrative. All the lyrics were similar to the style of drawing and they were telling the same kind of story. Then they started going off in different directions. As soon as that happened it felt like I couldn’t do both, I had to do either one or the other. I stopped doing artwork altogether for a while, and then I stopped making music for a few years and now I think I’ve got the balance back. In which ways do they influence each other? There are certain elements in what I do that are quite commercial or easily accessible and there are other parts that are not. For me, it’s about finding the right balance. As soon as people started saying “Oh I love those characters, they’re so cute” I started making them less cute, or I’d stop painting them for a while. Not to deliberately sabotage my own work, but as a means of switching it up and keeping things moving. At the minute I seem to have gone full circle, both my painting style and music is not that dissimilar to what I was doing in the late 90’s. I spent a lot of time exploring various ideas and now I think everything is cool and I’m happy with what I’m doing again. 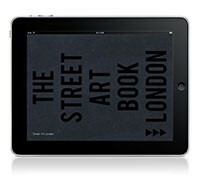 What do you think about the rise of interest in street art? There are various components that make something fall into one category or another, but there are always individuals on the periphery of whatever that is and they’re usually the most interesting. They’re doing their own thing regardless of fashion. Even if you didn’t like their stuff at the time, you tend to look back and think, “Oh yeah, that was cool. Their stuff was really different” and they’re the ones who get remembered. “Street art” and “urban art” is irrelevant in many ways. If you paint a wall in the middle of a field, it doesn’t become “field art” or “rural art” all of a sudden, it’s just art – either good or bad. If you couldn’t be creative and had to choose any other profession, what would it be? I would be an archeologist digging up bones with Time Team. Any upcoming projects you want to tell us about? I’ve been working on this animation called ZEBRA FACE so that’s been a pretty big project for the last 18 months or so. It’s nearing completion. Other than that – I’m just painting, making fanzines, music and staying out of trouble.